If someone says Bob Kraft owns the league, it'd be fair to assume they were referring to the New England Patriots' dominance over the last decade of the NFL. In actuality, they'd be referring to an upstart overseas in among the least likely of places for American football - the Holy Land. 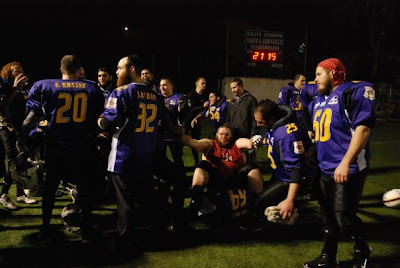 The Kraft Family Israel Football League is an amateur full contact American style football program, using modified NCAA rules, and is operated under the auspices of American Football in Israel. 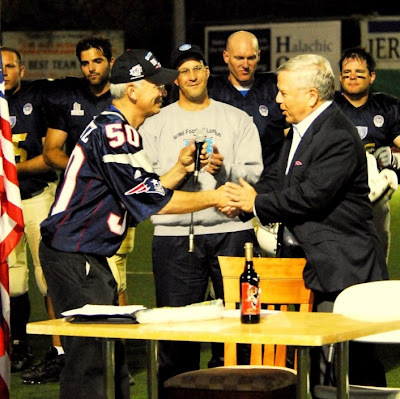 The IFL is sponsored by the Kraft Family, owners of the NFL's New England Patriots – one of the most successful sports franchises in the world. The Kraft Family IFL will operate to create the required infrastructure for successful American Football league in Israel and will promote the sport to become a nationwide self sustaining operation. As of such the Kraft Family IFL will put its efforts in activities which will jointly benefit American Football in Israel. Since it's inception in 2007, the league has successfully endeavored to bring the great game of football to a country whose population has traditionally devoted itself to soccer and basketball. The IFL currently fields 5 full teams, with several more in development. In addition, The IFL is developing a youth program to ensure that the league's future is as bright as its present. 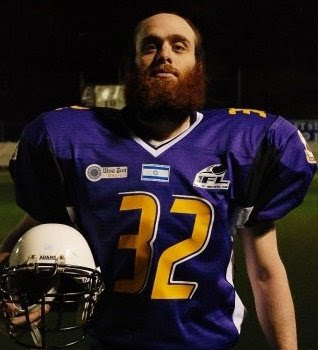 An old friend of ours, Joshua Rubin, is currently the Head Coach of one of the IFL's teams, the Jerusalem Kings, and also happened to fill in as a running back and wherever else on the field he was needed. We caught up with Josh to help us understand both the current state of the enterprise as well as its prospects for the future. HuggingHaroldReynolds: First, you're a kid from Jersey. How did you end up in Israel and what have you been doing over there outside of your involvement with the Kings? Joshua Rubin: Like a lot of kids from Jersey, after college I went to work in the City (Manhattan). It was the 'normal' thing to do; get a job, try to make a lot of money, meet women, etc. In my quest to make a lot of fast cash, I started day trading. Through Divine Providence, one of the guys in my day trading class had lived in Israel, and through him I started putting on Teffillin which lead me to reconnecting to my Judaism. I eventually gave up daytrading and I had enough of the whole 9-5 routine. So I packed my bags, flew to Israel and enrolled in Yeshiva (Mayanot Institute for Jewish Studies). I landed on June 17th of last year (2008) and I've been here ever since. Outside of the Kings I am in Yeshiva all day and night, praying, learning, studying and working on myself - things I "should have been doing" in college. Which is funny, because when I was playing this year, I felt like I was fulfilling a dream to be on a academic scholarship play football. HHR: How did you become familiar with the IFL and what prompted you to get involved? JR: When I first got to Israel it was a bit of a shock...I wasn't sure what I was doing here...not to many guys my age drop everything and go to Yeshiva. 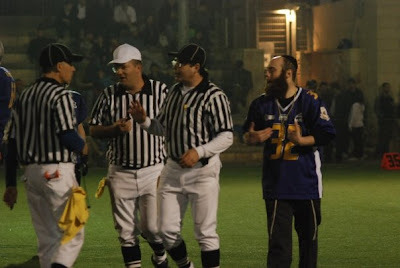 People to told me about the flag football league in Jerusalem (which has to be one of the most competitive flag leagues in the world). I did search the web for the flag league but found the IFL instead. By Divine Providence I ran into a guy wearing an IFL t-shirt who happened to be the manager of Kraft Field and he put me in touch with the IFL. When I first inquired, I wasn't sure how long I was going to be in Israel, so I figured I would help out a team by coaching but the league told me all they had was the new Jerusalem team that needed a head coach...so I figured what the heck, and I volunteered. How has the league been received by the public who, on the sports front, more enjoys soccer and basketball and also given the constant stress and turmoil in the region? The most popular sports in Israel are Soccer, Basketball, wind surfing and Judeo. There is certainly room for another major team sport in Israel. Most Israelis know about football and are attracted to it, however the IFL doesn't have a big budget for marketing, so right now knowledge of the league is spreading by word of mouth. Kings home games get about 100+ people right now, which might be the best in the league. There are a lot of Americans who don't know about the IFL yet and a lot more moving here, too. I wouldn't be surprised to have 500-1000 people at our games in 3 to 5 years. Constant stress and turmoil? In all seriousness it is more dangerous to live in New Jersey then in Israel. I'd bet there have been more people murdered in New Jersey over the last year then there has been people murder in Israel by terrorist attacks or war. Imagine if the entire world reported about New Jersey but only focused on the criminality that plagues Newark, Camden and the Sopranos, yet ignored all the great things that make Jersey a wonderful place to live? That's basically what you have in regards to peoples perception of Israel. That was one of my favorite experiences of the season. Most of these guys have been in the army and its not like in America where you need to yell at people to motivate them. That kind of attitude doesn't fly over here. Playing football is the closest most Americans get to fighting war. You're not going to get an Israeli to do something he doesn't want to do; Israeli's see football as fun and if they've taken the time to join the team, you know they are committed. All you have to do is show them what to do and they'll do it or figure out how to do it. I have so much respect, admiration and love for each and every guy on my team. I would encouraging anyone who is reading this not to hesitate to visit Israel, when you get hear you'll understand why I say that. HHR: What is the quality of play like? What sort of backgrounds do the players generally have? JR: Its very competitive. We play 8 on 8 on a 60 yard field (80 if you count to the back of the end zones), so its different game then we are used to playing in the States. The teams are very balanced, with the biggest advantage going to the team who is most disciplined in their game plan. The Kings have a wide range of talent. We have guys who have played college ball on scholarship, but most guys have never played the game before. I had teach to most of the the guys how to catch a ball, line up in a three point stance, the basics. Where we are now holding compared to the beginning of the season is amazing. All season long, they made up for their lack of experience with enthusiasm and love for the game and each other. They are all now real deal FOOTBALL PLAYERS! In my opinion, the Kings have been blessed by G-d to the best group of guys to ever make up a football team. While we did have a rough going this year (1-7), we were the only expansion team and did everything on the fly for most of the season. Heck, we only got our pads a week before our first exhibition game. Eventually we settled down and got things organized by our last game, but that was a little to late. The good news is we've built up a solid core group of guys and we know what we are doing now, so next year should be a much different story in regards to wins and loses. HHR: Do you see the league as being viable in the future? JR: Very much so. Right now it will, and should remain as, an amateur league, but the potential the league has is very exciting. I've been at league meetings and they are already thinking 10 years down the road. The IFL is not going to be like the baseball, which had a lot of money thrown into it and folded after one year. I have a lot of confidence in the people running the league. HHR: Tell us about the League's youth development initiative. JR: The Kings have a 15, a 16 and an 18 year old but also have a 36, a 38 and a 42 year old. I doubt there is another football team in the world that can claim that! All the Israeli kids I've talked to, from the grammar school to the high school kids, are all excited about the league. The IFL is planning on developing football for the youth in the future but I don't know how they plan on going about it. Football pads are expense, not every family can afford them and once the kids turn 18, they go to the army for 3 years. However, I am optimistic, to succeed in Israel you have to think outside the box, most importantly, nothing happens in Israel with out G-d's approval, so if He is for it, it will happen. HHR: How can football fans in the States keep up with the league? Is there any plan to push any web-based video? JR: They can go to the IFL website at www.ifl.co.il. As most media, it all going to the web but unfortunately we don't have an live broadcasts over the web. The best someone can also scan youtube for videos. I suppose Friday Night Lights would not be a title for a book among the Orthodox. From here,you can get the best goods with the lowest price. Allowing me to comment your site would be a great pleasure. Thank you. Your site is so great. Sports Online Betting is where you will bet in your online sports. All the Testking F50-522 Israeli kids I've talked to, from the Testking E20-855 grammar school to the high school kids, are all excited about the Testking 70-299 league. I'm happy I found this blog, I couldnt discover any info on this subject matter prior to. I also run a site and if you want to ever serious in a little bit of guest writing for me if possible feel free to let me know, i'm always look for people to check out my site. Please stop by and leave a comment sometime! Thanks for the bunch of good resourceful site.I really appreciate your blog,you have done the great job.I'm happy I found this blog, I couldnt discover any info on this subject matter prior to. The guy with a beard is quite funny lol :) Have you ever seen a football player with a beard like that? Not me.. Excellent post. I've read it with great pleasure. Nice post and thanks for sharing with us! !